50,000 square Feet of "We Do It Right"
Tomcor's commitment to excellence is reflected in everything we do throughout our entire Wausau facility. Our powder coating line is specifically engineered and designed for appliance grade finishes using state-of-the-art equipment and the most advanced efficiencies in the industry. Engineered consistency through an automated control center for operations and line up/down sequence. Approximately 1,600 feet of conveyor to accommodate sizable jobs. 8 to 16 feet-per-minute operating speed for timely application and rapid turnaround. Encapsulated stations to help prevent contamination. Sanitary pans and C-hooks for added appliance-grade control and contaminant protection when transferring parts, providing a "roof" over your parts. Clean-Cor™ surface pretreatment and sealing process for unsurpassed quality and durability at the start. Painting done in an environmental clean room with 100% filtered air for maximum contaminant control. 22 automated application guns, 2 manual guns deliver uniform powder-paint coverage. Bottom entry/bottom exit curing oven to prevent heat loss and ensure uniformity. Inline primer booth for dual coat applications. 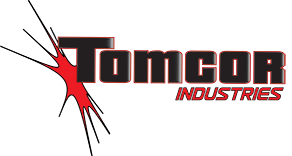 Visit us today and discover firsthand why Tomcor is Central Wisconsin's premier powder coating facility. Call (866) 927-2738 or e-mail sales@tomcorindustries.com to schedule your personal tour.